The Beechcraft T-34 Mentor had a long and productive service life, seeing service in the U.S.A.F., U.S. Navy, Coast Guard, and in many foreign countries. It was designed in 1948 as a replacement for the AT-6/SNJ airplanes, used by the U.S. military to train pilots during WWII. Six decades after the initial design, many specimens are still used in military roles! The notably economical cost to operate this airplane, coupled with its overall well behaved in-flight behavior, have made the T-34 one of the most sought after surplus aircraft ever! 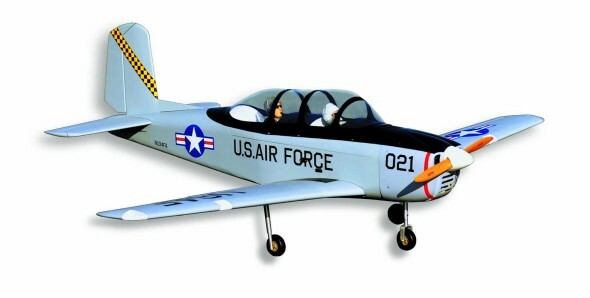 Seagull Models has captured the look and performance of the T-34 Mentor in this beautiful sport scale ARF. With a conventional balsa and plywood construction airframe, the Seagull Models can be powered by glow, gas, or electric. This comprehensive ARF kit includes fixed landing gear with oleo shock absorbing gear struts, with an option to fit electric retracts.